A fish finder is a perfect tool for the professional or dedicated Angler. It allows you to see schools of fish below the surface of the water, so you’ll have much more success and make your time on the boat more productive! We’ve put together this buying guide so you know which fish finders are the absolute best! Before we get started, let’s take a look at some things you should know. Display: This refers to what type of display the fish finder has. This can either be an LED or LCD screen, a 3D or color display. Really, this just tells you how the fish are going to show up. Display Size: This is the size of the screen that will display the location of your fish. Some of these fish finders are only sensors that will put the information directly on your phone screen, so keep that in mind. WiFi: Some fish finders come equipped with WiFi so that you can download different maps and location information. This will help you get even more information about your area and therefore give you the tools to fish more effectively. Rechargeable Battery: Sometimes fish finders will come with a battery that you can recharge, so you don’t have to keep replacing them. This is a neat, useful feature that we absolutely love. It’s convenient and better for the environment! Size: These are the dimensions of the fish finder, which is useful when trying to figure out where you’re going to pack it and how large the screen and features actually are. Sometimes, that’s really useful information. Warranty: A warranty protects both you and your purchase from defects produced by the manufacturing process. This will make sure that if it breaks or ceases to function during normal use, you can get a refund or replacement. Now that you know all there is to know about fish finders, we can get to the best fish finder reviews! We’ve included all of the best fish finders on the market right now so that you can make an informed decision about which one is right for you. Our top pick and budget pick are the best of the best, followed by the rest of our list – which is definitely worth a look! Find your new fishing companion! Even the best 7-inch fish finder can’t compete with the Raymarine Axiom 12. 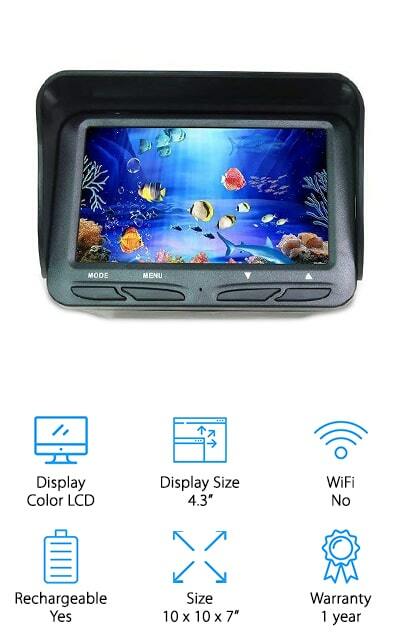 The amazing 12.1-inch display is the largest on our list, so you can clearly see where the fish are! It comes with RealVision 3D sonar so that you can see where the fish are in amazingly fast real time. Sonar is especially helpful for finding fish! The screen has a multi-touch interface, as well as a powerful operating system and a quad-core processor. This is an extremely powerful device, and one of the best fish finders for bass fishing, or any fishing for that matter! The enabled WiFi means that you can control the unit and view the results on your phone, which is amazing! It even includes charts that cover the coastal US, Canada, and over 20,000 inland ponds! How amazing is that? It even has stabilizing technology to compensate for the movement of your boat. 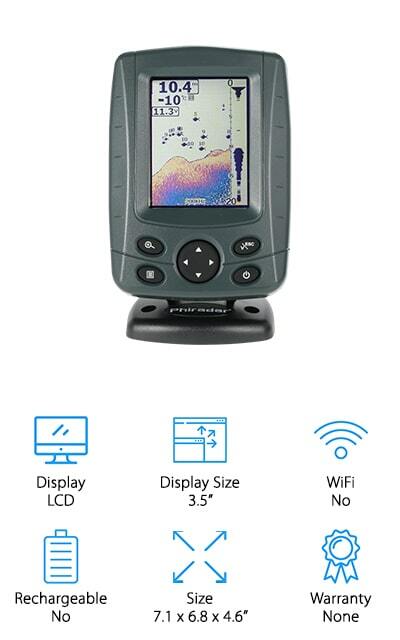 This fish finder has it all! Our budget pick is this Venterior device, which is simple and to the point! 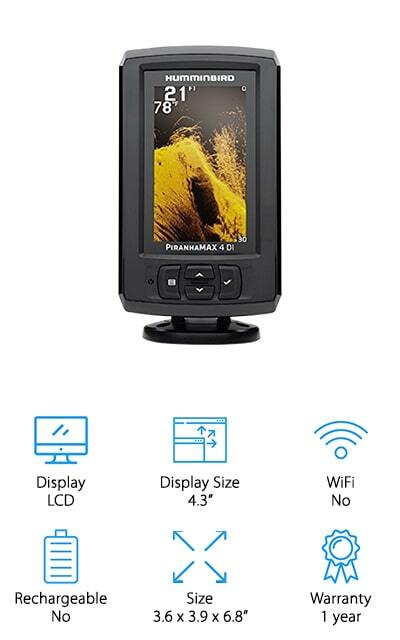 It delivers a beautiful picture on a 3.5-inch LCD screen, which displays the depth of the water, location of weeds, sand, and rocks, as well as the location of the fish. It can image down to a depth of 328 feet, so you’re going to be able to see plenty deep enough to get the fish that you want! The transducer has a 25-foot cable, which is long enough to allow you to use it on a boat or from the dock. In fact, this simpler device is probably the best fish finder for small boat fishing. You can choose various settings that are saved when you turn the device off, including a battery saving mode, a fish alarm, and a mode that allows you to have a backlight on the screen. We love how simple and yet effective this fish finder is! Garmin makes the best GPS chart plotter fish finder on our list. It’s an amazingly sophisticated device that uses CHIRP sonar into the water, providing you with a wide range of information and more accurate expectations for where the fish will be. Instead of scanning when you ask it to, it provides a continuous scan of the surrounding area so that you know more about your area. It comes with US BlueChart maps, and you can purchase additional maps and charts separately for use with the device. It’s a clear fish finder with a heavy-duty internal GPS device that will keep you in the know about what’s going on in the water below you. We love how sophisticated and accurate this device is! What makes this device to the next level is the Quickdraw Contours software, so you can create your own map of any body of water so it’s available as you need it, especially if you go there often. This Smart Sonar device by Deeper is one of the best fish finders for kayak fishing. It’s also great for fishing on most bodies of water, and for most fishing styles! 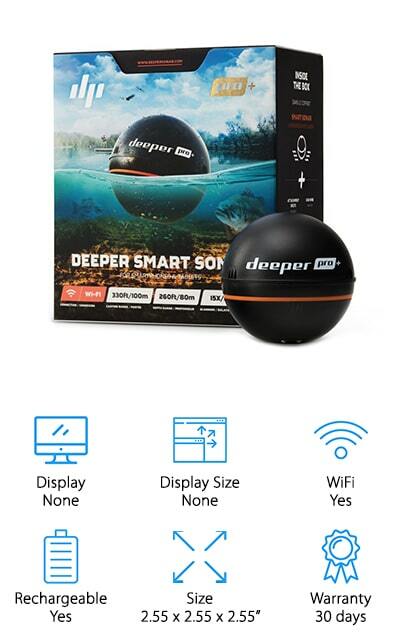 Instead of being a wired fish finder with a screen, this small bathysphere communicates with your iOS or Android device to send you the underwater data! It’s got an amazing connection range (up to 330 feet) and will mark anything up to half an inch in size under the water. It can capture down to a depth of 260 feet, which is useful for shallower fishing and for getting a good handle on where the schools of fish are. 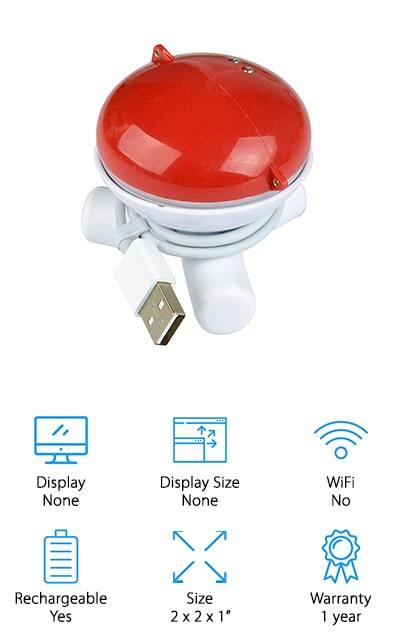 The accuracy and casting range definitely put this small device on our list! 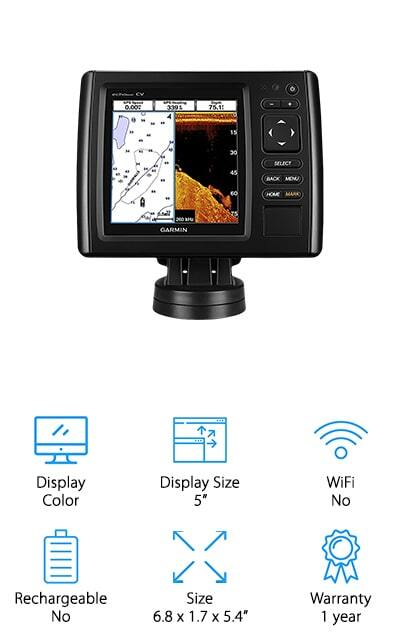 It has a GPS-enabled mapping feature that you can use from the shore to get a full view of the body of water, right on your computer screen or phone screen. That’s some pretty amazing technology. Humminbird is a trusted name in outdoor technology, and their PIRANHAMAX Fish Finder is definitely living up to the brand name. It has an amazingly sharp color display that’s 4.3-inches diagonally. It’s one of the best down imaging fish finders on our list because of the range on the sonar – an amazing 320 feet. This small unit is so amazingly technologically advanced and packs quite a punch! It can display in grayscale or a crisp 256 colors. 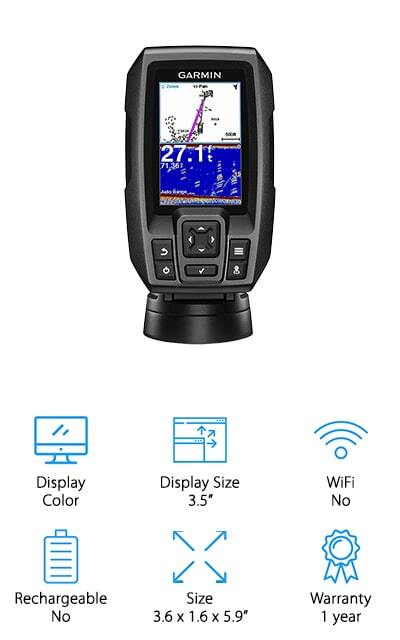 This fish finder is an amazing improvement on the previous models by this company, so it definitely knows what it’s doing, and doing it right. 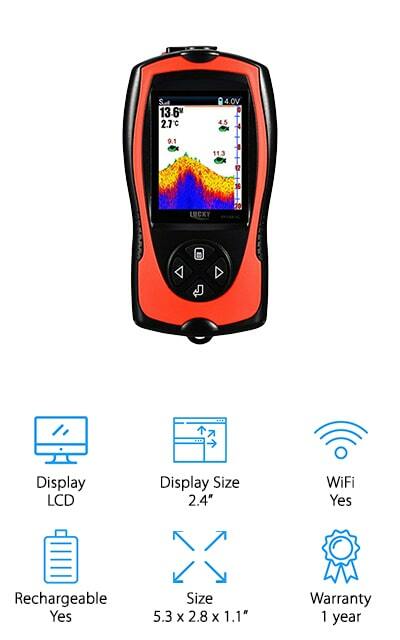 It comes with advanced Fish ID technology, alarms when fish show up, depth alarms, and a zoom feature that allows you to properly identify what’s going on. The sonar is extremely powerful and will give you a much better run at getting that perfect fish. For the dedicated fisherman, there is perhaps a no better gift. Garmin is back on our list again with the Striker 4, which is one of the best GPS fish finders on our list. It’s high-frequency sonar that gives you images that are almost like photos, allowing you to see detailed images of objects and fish so that you know exactly what you’re casting into. It’s also a simpler model than the previous one of our list because it has dedicated buttons instead of being a touchscreen. It’s easy to install and comes in a 3.5-inch, 5-inch, and 7-inch variety. You can easily make a waypoint map that will help you navigate brush or rocks, and maps down to an incredible depth of 1,600 feet in freshwater. Plus, it has a flasher that will allow you to view your sonar results in a more classic format. This fish finder is both technologically advanced and simple enough for even the most modest fisherman. We love that you can use it either way! The Docooler fish finder is great for all levels of fishermen and is perfect for use in just about any body of water as well. It has an auto zoom feature so that you can get to the lowest level of the multi-depth range, to see what you’re going to be encountering. One of the coolest things about this fish finder is that there are 100 levels of sensitivity that you can set, which is wonderful for getting the perfect image at the perfect location. You can select your favorite sonar chart, and it also has a language setting to display in 15 different languages if that’s something that you need. It includes an audible fish alarm and can display different types of undergrowth on the bottom of the seat as well. We absolutely love all the different levels of customization and readings that this fish finder produces, and all of the different features you can use! The Lucky Portable Fish Finder is one of the best small boat GPS fish finders that we found during our research. It’s packed full of amazing features, including wireless operation, a depth detection of about 147 feet, and the ability to fish however you want to. This versatile little device will be your friend no matter which type of poles you’re taking out on any given day. It even shows accurate fish size so that you can get excited about catching the biggest one. It even has a simulation mode so that you can test it out and not waste any time on the water trying to figure out how to use it. It’s great for all different types of fishing, including ice fishing or night fishing. It includes a screen brightness feature, depth range, zoom capabilities, and an audible fish alarm and icon. 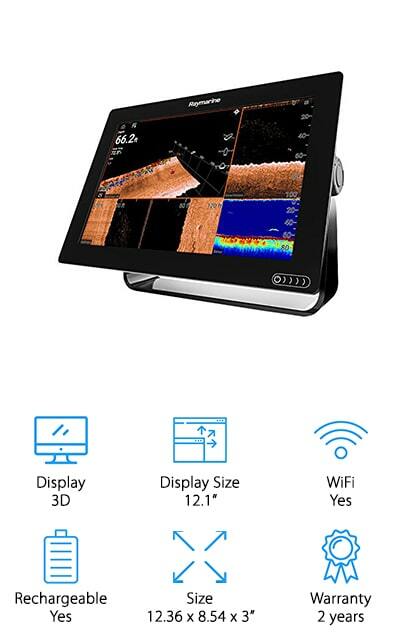 We love all of the different features that this fish finder has! Plus, it’s rechargeable! The ReelSonar iBobber is another fish finder that uses your phone instead of a screen to display the results of its sweeps. It has patented identifying technology so that you’re able to properly identify the fish that you’re seeing, in case there is a specific type of fish you want to catch. It’s probably one of the best fish finders for shallow water because it only reads down to a depth of about 135-feet. However, this also depends on your ability to connect to your phone. When you can do that, you can enjoy over ten hours of battery life on a single charge. You can use it as a bobber or remotely, which is one of the things we like most about this fish finder. You can use it however you like, and you’ll get accurate results either way! We love that you can use it with the free app to get beautiful images! 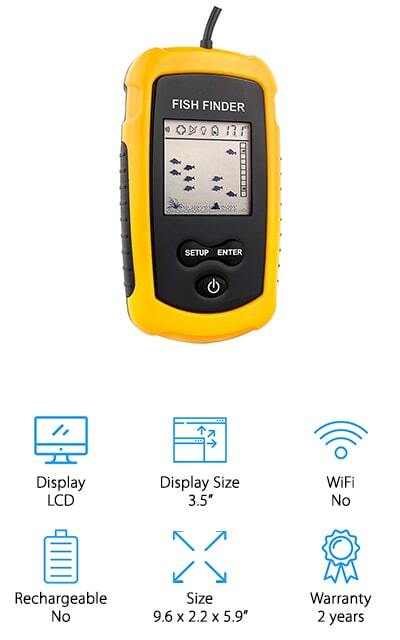 This fish finder from Wosports is an incredible little tool that would make the perfect gift for the fisherman in your life! It’s got an amazing rechargeable battery and is completely waterproof for deep water. It’s basically an underwater camera that has infrared night vision support, as well as a wide-angle lens so that you get the best out of your fishing experience. We love that instead of being sonar-based, this device actually just sends you a picture of what’s going on under the water, which can be extremely useful in certain situations. It even has its own light so that you can see, and we love the 720P real time video option. That really makes for a great fishing experience! There is so much that comes with this little camera, we’re sure that you’re going to appreciate it just as much as we do! So go out there and catch that big trophy fish!